Wrist pain has many possible causes. The wrist joint is an intricate assembly of 10 bones with associated joints and ligaments. In addition there are at least 20 tendons and several large and small nerves immediately adjacent. Aches and pains which result from impacts or repetitive or strenuous activities may indicate significant injury or degradation of the wrist joint. There may be no abnormality in the wrist joint itself but adjacent tendons and nerves are the cause of symptoms. There are also a number of conditions which can arise spontaneously. Wrist pain is assessed with a thorough discussion of symptoms, systematic examination and, usually plain x-rays. It is often necessary to have an MRI scan. Less often, nerve conduction tests, ultrasound or CT scans are required. Keyhole surgery (wrist arthroscopy) is also helpful in some circumstances and this can be both exploratory and allow some types of treatment. Not infrequently, there may be no discoverable cause. 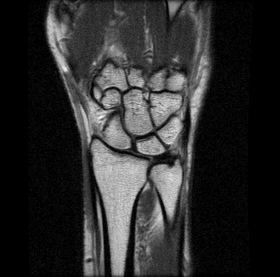 MRI scan of the wrist. The complex relationship between the bones of the wrist is clearly apparent. Fusion of the wrist joint is sometimes necessary to treat advanced arthritis. Pain is relieved but movement is lost. 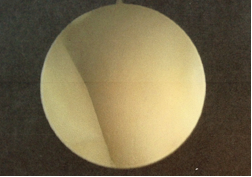 Total Wrist Joint Replacement is also available which is good at relieving pain and allows some movement to be retained. Wrist from the inside. Wrist Arthroscopy / 'Keyhole' surgery to examine the joint surfaces and ligaments in the wrist.